Black housing with multi-color outlets. 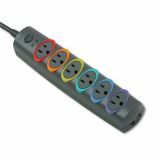 Kensington SmartSockets Color-Coded Strip Surge Protector, 6 Outlets, 8ft Cord, 1260 Joules - SmartSockets Premium Color-Coded Surge Protector helps protect computers and modems from damaging power surges and spikes. Six color-coded rings with matching cord labels provide easy cord management. Protector also offers EMI/RFI noise filtration, fax/modem protection, a right-angle plug, recessed on/off switch and 8' power cord.